Coexisting With Nonhuman Animals: Hows this for an ending? Hows this for an ending? All the Cool Kids have a signature ending, quick, play along at home, how many of these do you recognise? 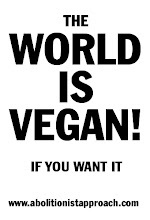 "If you are not vegan, go vegan. It’s easy; it’s better for your health and for the planet. But, most important, it’s the morally right thing to do." Ok, so "signature endings" are not so common that I could quickly name more than two offhand....but my inferiority complex is only matched by Kanye Wests sense of self worth. I *only* have a blog, show and Vegan Society all of my own, its about time I got with the program and had "an ending" worked out, right? "Its as easy to be Vegan as not, and its the least others deserve, not to be seen as a "it", or a "thing", but respected as a Friend." What do you think of my ending? I'd love to hear any improvements you may have! I like your proposed signature ending. It resonated with me when I read your previous post, "Happy EVERY Day!" Kill and eat Animals, catch Herpes! MJcast, our new Michael Jackson show! Invercargill Vegan Society Business Cards Arrive! "Chicken so tasty it sells itself"